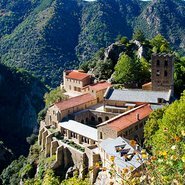 Join Art Gallery Society President, Brian Ladd and discover why Romanesque monasteries situated in remote Pyrenean mountain valleys and significant Gothic quarters in the cities of Girona, Barcelona and Palma de Mallorca, helped shape the distinctive Catalan character. The Catalonian culture has produced outstanding art and architecture across the ages. This talk will explore the vibrant artistic heritage, including from the modern era, found in picturesque regions of north-eastern Spain and south-eastern France, where Catalan communities have existed for more than a thousand years. Image: Abbey of Saint-Martin-du-Canigou, Pyrenees on Canigou mountain, France.